This article is about the astronomical event when the sun is at zenith over the Equator. For other uses, see Equinox (disambiguation). For the same event happening on other planets and setting up a celestial coordinate system, see Equinox (celestial coordinates). It has been suggested that March equinox and September equinox be merged into this article. (Discuss) Proposed since December 2012. 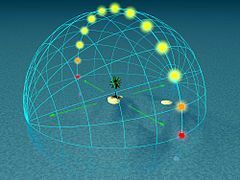 An equinox occurs twice a year (around 20 March and 22 September), when the plane of Earth's equator passes the center of the Sun. At this time the tilt of the Earth's axis is inclined neither away from nor towards the Sun. The term equinox can also be used in a broader sense, meaning the date when such a passage happens. The name "equinox" is derived from the Latin aequus (equal) and nox (night), because around the equinox, night and day are about equal length. At an equinox the Sun is at one of two opposite points on the celestial sphere where the celestial equator (i.e. declination 0) and ecliptic intersect. These points of intersection are called equinoctial points: classically, the vernal point (RA = 00h 00m 00s and longitude = 0º) and the autumnal point (RA = 12h 00m 00s and longitude = 180º). By extension, the term equinox may denote an equinoctial point. The equinoxes are the only times when the terminator is perpendicular to Earth's equator. Thus the Northern and Southern hemispheres are illuminated equally. (At the solstices, that angle reaches its minimum of 66.5°, corresponding to 90° minus Earth's axial tilt). Another meaning of equinox is the date when day and night are the same length. The equinox is not exactly the same as the day when day and night are of equal length for two reasons. Firstly, because of the size of the sun, the top of the disk rises above the horizon (constituting 'sunrise' which is the start of 'daytime') when the center of the disk is still below the horizon. Secondly, Earth's atmosphere refracts sunlight which means that an observer can experience light (daytime) even before the first glimpse of the sun's disk has risen above the horizon. To avoid this ambiguity the term equilux is sometimes used in this sense. [note 1] Times of sunset and sunrise vary with an observer's location (longitude and latitude), so the dates when day and night are of exactly equal length likewise depend on location. For places near the equator the daytime is always longer than the night, so they would never experience an equinox by this definition. When Julius Caesar established his calendar in 45 BC he set 25 March as the spring equinox. Since a Julian year (365.25 days) is slightly longer than an actual year the calendar drifted with respect to the equinox, such that the equinox was occurring on about 21 March in AD 300 and by AD 1500 it had reached 11 March. This drift induced Pope Gregory XIII to create a modern Gregorian calendar. The Pope wanted to restore the edicts concerning the date of Easter of the Council of Nicaea of AD 325. (Incidentally, the date of Easter itself is fixed by an approximation of lunar cycles used in the Hebraic calendar, but according to the historian Bede the English name "Easter" comes from a pagan celebration by the Germanic tribes of the vernal (spring) equinox.) So the shift in the date of the equinox that occurred between the 4th and the 16th centuries was annulled with the Gregorian calendar, but nothing was done for the first four centuries of the Julian calendar. The days of 29 February of the years AD 100, AD 200, AD 300, and the day created by the irregular application of leap years between the assassination of Caesar and the decree of Augustus re-arranging the calendar in AD 8, remained in effect. This moved the equinox four days earlier than in Caesar's time. Vernal equinox and autumnal equinox: these classical names are direct derivatives of Latin (ver = spring and autumnus = autumn). These names are based on the seasons, and can be ambiguous since seasons of the northern hemisphere and southern hemisphere are opposites, and the vernal equinox of one hemisphere is the autumnal equinox of the other. Spring equinox and fall equinox or autumn equinox: these are more colloquial names based on the seasons, and are also therefore ambiguous across hemispheres. March equinox and September equinox: names referring to the times of the year when such equinoxes occur. These are without the ambiguity as to which hemisphere is the context, but are still not universal as not all people use a solar-based calendar where the equinoxes occur every year in the same month (as they do not in the Islamic calendar and Hebrew calendar, for example), and the names are not useful for other planets (Mars, for example), even though these planets do have seasons. Northward equinox and southward equinox: names referring to the apparent motion of the Sun at the times of the equinox. The least culturally biased terms. Vernal point and autumnal point are the points on the celestial sphere where the Sun is located on the vernal equinox and autumnal equinox respectively. Usually this terminology is fixed for the Northern hemisphere. First point (or cusp) of Aries and first point of Libra are names formerly used by astronomers and now used by navigators and astrologers. Navigational ephemeris tables record the geographic position of the First Point of Aries as the reference for position of navigational stars. 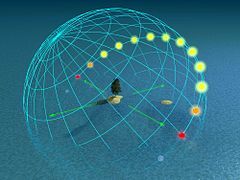 Due to the precession of the equinoxes, the astrological signs of the tropical zodiac where these equinoxes are located no longer correspond with the actual constellations once ascribed to them. The equinoxes are currently in the constellations of Pisces and Virgo. In sidereal astrology (notably Hindu astrology), by contrast, the first point of Aries remains aligned with Ras Hammel "the head of the ram", i.e. the Aries constellation. On the day of the equinox, the center of the Sun spends a roughly equal amount of time above and below the horizon at every location on the Earth, so night and day are about the same length. The word equinox derives from the Latin words aequus (equal) and nox (night). In reality, the day is longer than the night at an equinox. Day is usually defined as the period when sunlight reaches the ground in the absence of local obstacles. From the Earth, the Sun appears as a disc rather than a point of light, so when the center of the Sun is below the horizon, its upper edge is visible. Furthermore, the atmosphere refracts light, so even when the upper limb of the Sun is 0.4-degree below the horizon, its rays curve over the horizon to the ground. In sunrise/sunset tables, the assumed semidiameter (apparent radius) of the Sun is 16 minutes of arc and the atmospheric refraction is assumed to be 34 minutes of arc. Their combination means that when the upper limb of Sun is on the visible horizon, its center is 50 minutes of arc below the geometric horizon, which is the intersection with the celestial sphere of a horizontal plane through the eye of the observer. These effects make the day about 14 minutes longer than the night at the Equator and longer still towards the Poles. The real equality of day and night only happens in places far enough from the Equator to have a seasonal difference in day length of at least 7 minutes, actually occurring a few days towards the winter side of each equinox. Most places on Earth use a time zone which differs from the local solar time by minutes or even hours. For example, if the Sun rises at 07:00 on the equinox, it will set 12 hours later at 19:00. Even people whose time zone is equal to local solar time will not see sunrise and sunset at 06:00 and 18:00. This is due to the variable speed of the Earth in its orbit, and is described as the equation of time. It has different values for the March and September equinoxes (+8 and −8 minutes respectively). Night includes twilight. If dawn and dusk are instead considered daytime, the day would be almost 13 hours near the equator, and longer at higher latitudes. Some of the statements above can be made clearer by picturing the day arc (i.e., the path the Sun tracks along the celestial dome in its diurnal movement). The pictures show this for every hour on equinox day. In addition, some 'ghost' suns are also indicated below the horizon, up to 18° below it; the Sun in such areas still causes twilight. The depictions presented below can be used for both the Northern Hemisphere and the Southern Hemisphere. The observer is understood to be sitting near the tree on the island depicted in the middle of the ocean; the green arrows give cardinal directions. The Sun culminates at no more than 20° altitude and its daily path at sunrise and sunset is at a shallow 20° angle to the horizon. Twilight lasts for more than four hours; in fact, there is barely any night. The same is true in western tropical astrology: the vernal equinox is the first point (i.e. the start) of the sign of Aries. In this system, it is of no significance that the equinoxes shift over time with respect to the fixed stars. The March equinox passed from Taurus into Aries in year −1865, passed into Pisces in year −67, will pass into Aquarius in year 2597, will pass into Capricornus in year 4312. It passed along (but not into) a 'corner' of Cetus on 0°10' distance in year 1489. A number of traditional spring and autumn (harvest) festivals are celebrated on the date of the equinoxes. When the planet Saturn is at equinox, its rings pick up almost no light, as seen in this image by Cassini in 2009. Equinox is a phenomenon that can occur on any planet with a significant tilt to its rotational axis. Most dramatic of these is Saturn, where the equinox places its normally majestic ring system edge-on facing the Sun. As a result, they are visible only as a thin line when seen from Earth. When seen from above – a view seen by humans during an equinox for the first time from the Cassini space probe in 2009 – they receive very little sunshine, indeed more planetshine than light from the Sun. This lack of sunshine occurs once every 14.7 years. It can last a few weeks before and after the exact equinox. The most recent exact equinox for Saturn was on 11 August 2009. Its next equinox will take place on 30 April 2024.